Shimano Alfine 8-speed hub gears, Gates beltdrive, dynohub integrated lights, Shimano hydraulic disc brakes, lightweight aluminium forks - this is the lighter and faster version of the Endeavour 8! The advantages of a belt drive transmission are compelling. The carbon fibre-reinforced rubber belt lasts around twice as long as a steel chain, it's much lighter, it won't stretch and will never rust so you will never need to lube it. The absence of oil means the belt doesn't attract dirt the way that even a well-maintained steel chain might. Gates (who have been based in Colorado for over 100 years and who also manufacture in Dumfries, Scotland) are the world leaders in timing belts for cars. They worked in close collaboration with Wayne Lumpkin (founder of Avid brakes) in the development of their Belt Drive system. You can be confident that this technology has been precision tested. Being manufactured by the same company, you can be confident that the tooth profile of Gates' Carbondrive chainset and rear cog will mesh perfectly with the Gates belt for optimal drivetrain efficiency. A Belt Drive transmission can't be derailed. If you are looking for a multi-geared belt drive bike you need a hub gear transmission. 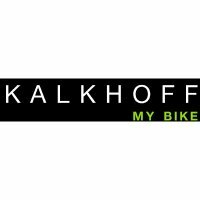 Here, Kalkhoff spec the superior Shimano Alfine 8-speed hub with the Shimano Alfine Rapidfire trigger shifter.